In today's time there is no more dynamic and fascinating field to either practise or study than branding, promotion and advertising. But in today's growing environment this field is undergoing dramatic changes that are changing advertising and promotion forever. The changes are coming from all sides-clients demanding better results from their advertising and promotional money; lean but highly creative smaller advertising agencies; sales promotion and direct-marketing firms, as well as interactive agencies, which want a larger share of the billions of dollars companies spend each year promoting their brands and services; consumers who no longer respond to traditional forms of advertising; and new methods that may reinvent the very process of advertising. 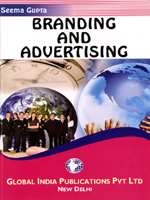 This book is an attempt to include all these and many more similar topics related to branding and advertising in a pragmatic and simple way.